These pieces glow like a well-tended smudge fire, fending off the banality of what has come to pass as fishing stories—the pompous pretensions of the competitive jet-set angler—from Wetherell (North of Now, 1997, etc.). Wetherell is not a prolific writer on fly-fishing, though he is one of the best. He is the kind of guy who stops and smells the coffee while astream: Intuition tells him that knowing “something of the landscape, terrain, history, and culture of the region through which your river flows” is infinitely more important than casting talent. It is elusive, that feel for a place, but attentiveness to it is the only game in town for Wetherell. Some of the best accounts in this book are the tours on which he takes readers to various locales, setting the rivers in their context as he tries to learn the quirks and portents of the water. 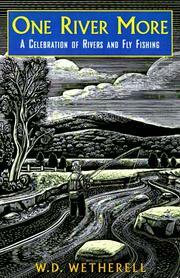 He shares the joys of discovering a river new to him, the upper Connecticut, where the wild trout announce that “life can be ironic and bitter and cruel, and it is only moments and places like these that redeem it.” He takes trips to Maine fishing camps, forgotten outposts now vulnerable as their very rareness and isolation act as enticements. He also visits Vermont fishing clubs that seek to maintain a level of authenticity. Wetherell is enjoyable as the curmudgeon (fuming when he finds a parvenu fishing one of his secret holes—the freebooter is talking on a cell phone too—he wants to “slink back to the 1940s where I belong”), whether complaining about the commercialization of the sport, ripping into “the contemporary fascist style in sportswear,” or detailing the importance of secrecy when it comes to giving out tips. Wetherell doesn’t claim an ability to untie every knot a river throws his way, and there are many. It is a humility that becomes him.